Dorothy Gilliam in her Midtown garden. St. PETERSBURG — A garden grows to the sky. A garden filled with Japanese sunflowers, a magnolia tree and blooming orchids. A garden planted with a northern pine and butterfly tree, and palms and lilies. A garden imbued with grace. Dorothy Gilliam grows her garden on two lots in Midtown. 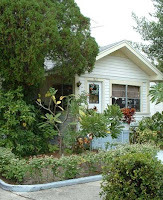 Her house is surrounded by hundreds of potted and soil-bound plants and trees. With the help of the Pinellas Opportunity Council, she is able to maintain her garden at the age of 90. She has lived in her wood frame home for the past 30 years. Gilliam said she takes care of the garden with help from family and friends and inspires others to grow gardens. The Chore Services Program at the Pinellas Opportunity Council helps people over the age of 60, regardless of income, who need help with yard and in-home cleaning. Gilliam has a lemon and banana tree, a grapefruit and orange tree, and a beat and avocado tree. 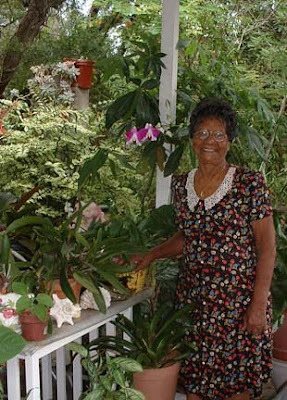 She has tomatoes, peppers, pineapples, sugarcane, ferns and cactus. The federally funded Chore Program is a one-time per year service for those who qualify. Applicants fill out a questionnaire, which is submitted to the Department of Elder Affairs. An assessment is made based on their needs. Kathy Russell, program director at Pinellas Opportunity Council said once a client is approved, a scoring system determines when the service will begin. Russell said homeowners who have received city or county code violations for alley or fence overgrowth or for yard debris—old cars, tires, or appliances—get prioritization. Russell said the Pinellas Opportunity Council has offered chore services to Pinellas County residents since 1977. Due to the economic downturn and loss of funding, they have had to cut back. They have one crew of two people for yard cleanup that goes out at least twice a week. Steve Bell, maintenance supervisor at the Pinellas Opportunity Council, said a yard cleanup can take anywhere from two to five days. Some yards are littered with buckets, cinder blocks, lumber and junk. Bell has worked with Pinellas Opportunity Council for 29 years and said the yard service is designed for people who really need it and whose yards are overgrown and neglected.